The DN200 offers two channels of high headroom, dynamic response and sonic clarity in a low-profile enclosure. It is ideal for interfacing computers, keyboards, samplers and other electronic musical instruments to mixing consoles, and faithfully reproduces the character of electric and acoustic instruments. DN200 is intended for professional applications where +48 V phantom power is a standard feature on all mixing consoles, and its innovative design results in a significantly higher clipping point than many other active DI Boxes, providing +10 dBu output into a 2KΩ load. This increased headroom means that much higher input signals can be accommodated without the need for an attenuating pad. Combined with a low noise input circuit topology, DN200 offers a wide dynamic range and only requires a single -20 dB pad, which is optimized for use with electronic musical instruments. Exhaustive listening tests using a wide variety of active and passive bass guitars, electric-acoustic guitars and electronic musical instruments were carried out to select the components for DN200 to achieve the best musical sound. Not only was the choice of the audio transformer particularly important in achieving this goal, but the impedances of the surrounding components were also critical in getting the best performance out of the audio transformers. The line-driving characteristics of the transformer outputs were optimized to provide the best frequency and phase responses for short and long cables and widely differing line and termination impedances. Care was taken in the design of the DN200 to avoid audio transformer core saturation and a fixed high pass filter has been included in the signal path to roll off frequencies below those that are musically important. The lowest note on a 5- or 6-string bass guitar is B0 with a frequency of 30.87 Hz, and the lowest note on an 88-key piano keyboard is A0 with a frequency of 27.50 Hz. DN200 still maintains a frequency response of ±0.5 dB at these lowest musical notes. A custom instrumentation-grade input circuit was designed for the DN200 using advanced analogue design techniques to create the very high input impedance required by passive guitar and bass pickups, whilst keeping the actual component values low to minimise noise. This innovative approach to circuit design produces a very low noise floor, which combined with the high clipping point creates an unrivalled dynamic range in a +48 V phantom powered DI Box. DN200 features two Neutrik Combo combined XLR and ¼ " TRS connectors with dual input impedances. 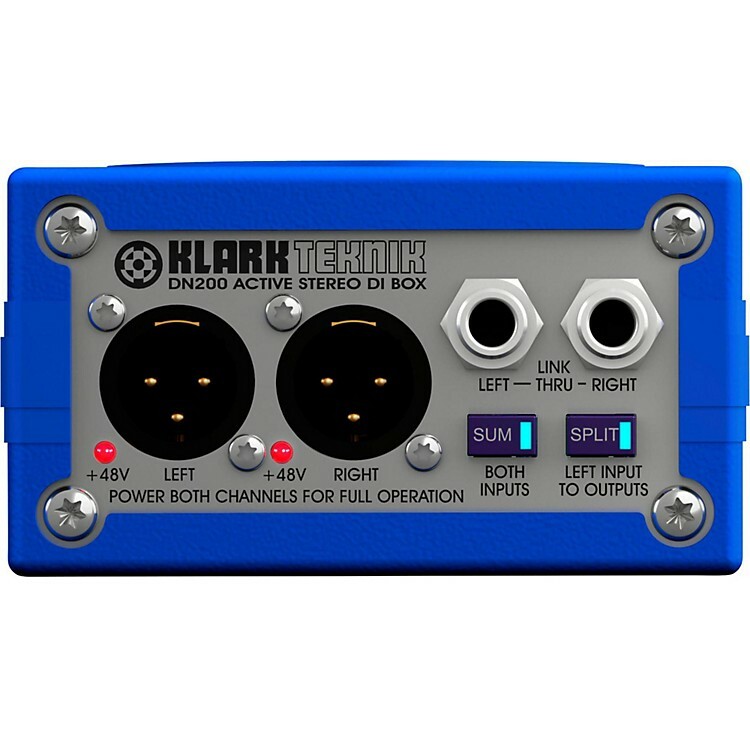 When connecting to the XLR input only, the input impedance is 20 kΩ, ideal for line level equipment and offering even lower noise performance. This input impedance is far too low for guitar and bass pickups and is removed from the circuit when a jack plug is inserted into the ¼ " TRS input, resulting in a nominal 1 MΩ input impedance, ideal for passive electric pickups. Stereo RCA Phono inputs are also provided for the connection of consumer audio equipment and also feature a 20 kΩ input impedance. Link output ¼ " TRS jack connectors are also included for each channel. DN200 features illuminated global 20 dB Pad and Ground Lift switches, which act on both channels simultaneously, which along with the individual +48V indicator LEDs for the independent phantom powering of the two channels, provide 'at a glance' status display, even at wide distances and viewing angles. The Ground Lift switch separates the input and output grounds, useful in eliminating earth loops between equipment on different mains electricity supplies. Featuring a tough aluminum extrusion, the DN200 is designed for the rigors of live concert touring. The protective silicone rubber sleeve also insulates the DN200 chassis to further enhance its electrical isolation. Premium Neutrik XLR connectors are used to ensure reliable audio connections, night after night. Reliable performance in the studio or on stage.